Looking for lawn fertilizing tips? Summer is the high season for your lawn. That’s when it gets the most traffic and the most hours of sun each day. However, it also gets the least amount of rain and requires more maintenance than during other seasons of the year. Fertilizing your yard during summer may seem to be counterproductive. You don’t want it to grow even faster, but by maintaining a fertilization regimen, you are improving the quality of your lawn and preventing weeds and other threats from getting a foothold. In the southeast region of the United States, lawns are typically made up of warm-season grasses. The ideal time to fertilize such grass is once in early summer and again in late summer. If the grass in your lawn goes dormant during winter months, it is important to be sure the late summer fertilizer application occurs no later than August. 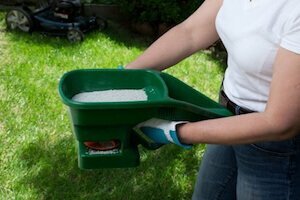 Before you apply fertilizer, take the time to prep your lawn properly by doing some soil aeration. Through the strategic creation of the holes in your grass, especially in thick thatch areas, you provide access to the roots. This means your lawn gets the full benefit of your fertilization regimen. If the thatch layer in a particular area is larger than a half-inch thick, it definitely needs aeration before fertilizer application. A day or two before fertilizer application, water your lawn to prep it. Apply fertilizer at the beginning or the end of the day, when temperatures are cooler. Make sure you follow up with a good watering immediately following the application to help the fertilizer absorb into the lawn. However, don’t overwater! Avoid fertilizing before a big rainstorm as the excess water may wash away the fertilizer, rendering your efforts useless. Water your lawn regularly, thoroughly, and during the coolest times of the day to prevent evaporation. Thorough watering ensures roots will grow deeper and your lawn will remain lush. Pay attention to water restrictions, rainfall, grass type and soil type to ensure your lawn gets sufficient water, but not too much. Cut your grass regularly and maintain it at the optimal height. Different types of grass come with unique recommendations as to the ideal summer height. Follow the guidelines for your lawn. Regularly cutting the grass will help maintain its appearance, discourage weed growth and ensure you get the most from your fertilization efforts. Isn’t grasscycling just being lazy and not cleaning up the yard? Not at all. When done right, it can be an important part of a healthy lawn. Grasscycling is simply allowing grass clippings to remain on the lawn following each mowing. The key to doing this effectively is to mow your lawn regularly. If your grass gets too long, don’t leave those clippings behind. However, the short clippings generated by your regular mowing will help fertilize your lawn. In fact, as much as 25% of the fertilizer needed by your lawn can come from grasscycling. The idea of using compost intrigues many homeowners, as they see it as an environmentally-friendly choice for their lawn care. However, when choosing compost, remember not to use it during summer. It is best applied in early spring, unless you are looking to regrow new grass in areas of thin turf. If you do apply it, work it into the soil with a rake and follow the application with watering. Compost is incredibly helpful at replenishing the nutrients lost in your lawn. Attention to lawn care during the summer months is crucial to the health of your lawn. 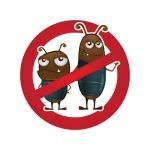 By neglecting to water or cut your grass regularly during hot summer months, you may end up with bald patches, brown grass, bugs and weed problems. When this happens, fertilization efforts tend to go by the wayside in exchange for efforts to regrow grass and eradicate weeds and pests. Staying on top of your lawn care plan is the key to success for warm weather grasses. 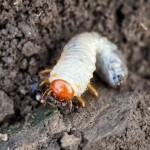 Need help with your summer lawn care? For more lawn fertilizing tips or to set up a customized plan for your healthiest lawn, call our team of professionals at Think Green Lawn Service now at 844.648.2556. Before you know it, your lawn will be looking better than you have ever seen it.